St. Patrick’s Day is March 17. Wikipedia states that “Saint Patrick’s Day or the Feast of Saint Patrick is a cultural and religious holiday celebrated on 17 March. It is named after Saint Patrick (c. AD 385–461), the most commonly recognized of the patron saints of Ireland. There are all types of symbols associated with this day: shamrocks, leprechauns, four leaf clovers, the color green, pots of gold and rainbows. As a kid we would take green pipe cleaners and twist them into four-leaf clovers. Then we would pin them to our shirts for the day. It was quite popular to be pinched if your weren’t wearing green on St. Patrick’s Day. Now, whether or not you celebrate the holiday or not, a rainbow salad is a fun way to brighten up any meal. You may use any fruit, if it is the color that you want. For example you could substitute watermelon for the strawberries, cantaloupe for the cutie oranges and honeydew melon for the kiwis. 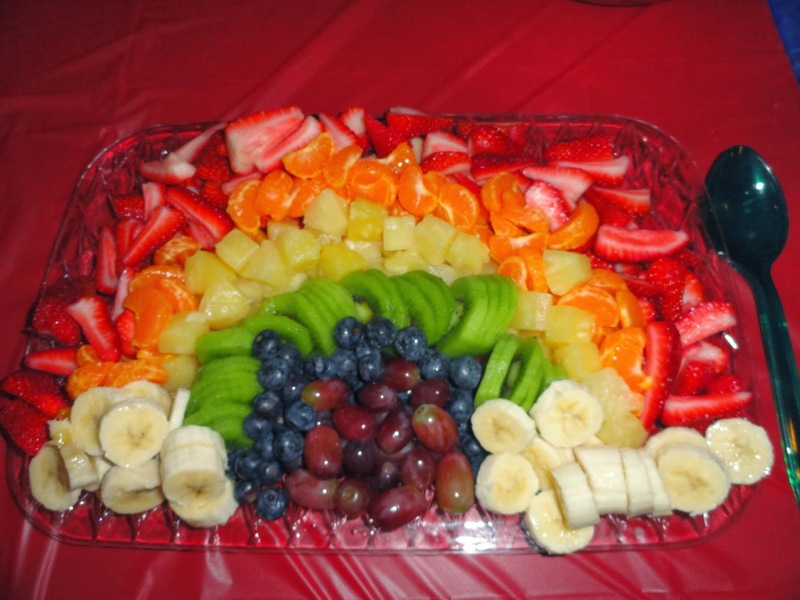 Just arrange them on a tray in the colors of the rainbow: red, orange, yellow, green, blue, purple. Then if desired, add cut bananas or mini marshmallows on each end for “clouds”. Why not try this with vegetables too? Cauliflower would make great clouds! I would love it, if someone would send me a photo of a rainbow vegetable salad!